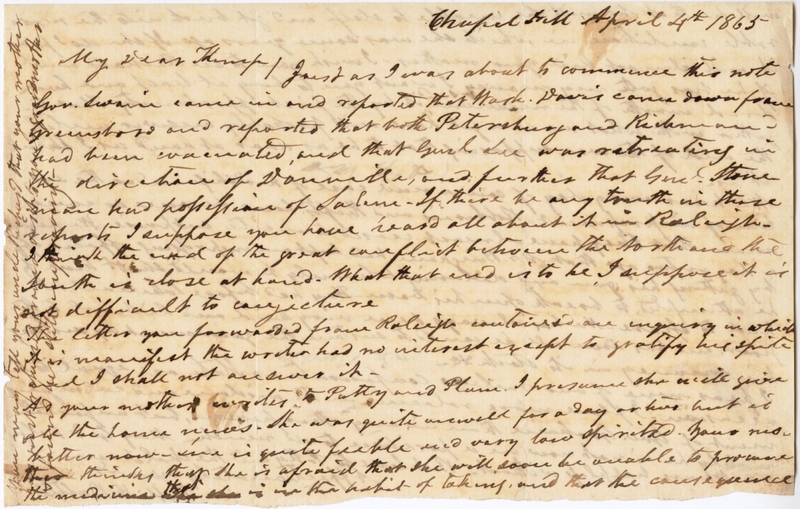 Item Description: Letter from William Horn Battle to his son Kemp Battle. He writes about hearing that Petersburg and Richmond had been evacuated and he feels the war will soon be over. He also mentions that Kemp’s mother is almost out of medicine and requests that Kemp buy some for her in Raleigh. He also writes about how common robberies are in the area. Just as I was about to commence this note Gov. Swain came in and reported that Wash. Davis came down from Greensboro and reported that both Petersburg and Richmond had been evacuated and the Genl Lee was retreating in the direction of Danville and further that Genl. Stoneman had possession of Salem. If there be any truth in those reports I supposed you have heard all about it in Raleigh. I think the end of the great conflict between the North and the South is close at hand. What that end is to be I suppose it is not difficult to conjecture. The letter you forwarded from Raleigh contained an inquiry in which it is manifest the writer had no interest except to gratify his spirit and I shall not answer it. As your mother writes to Patty and Plum I presume she will give all the home news. She was quite unwell for a day or two but is better now. She is quite feeble and very low spirited. Your mother thinks that she is afraid that she will soon be unable to procure the medicine that she is in the habit of taking and that the consequence will be that she will be unable to sleep and get back into the measurable condition in which she was some years ago. If she do I fear it will almost kill your mother. 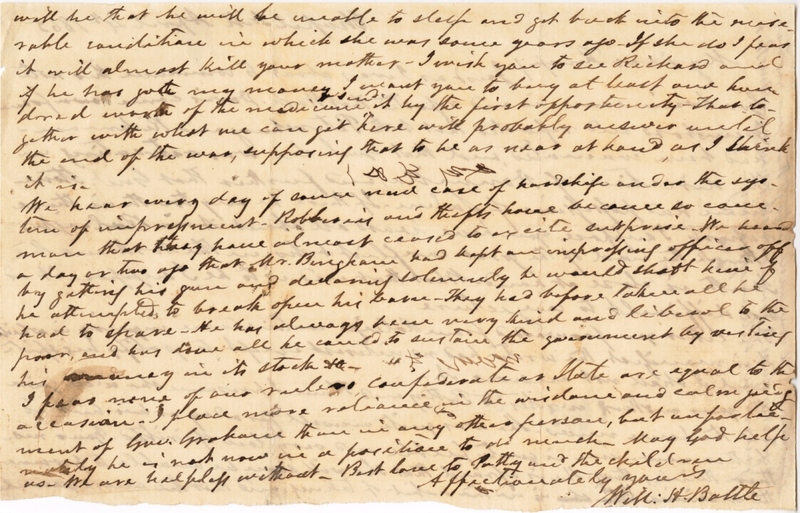 I wish you to see Richard and if he has got my money I want you to buy at least one hundred worth of the medicine & send it by the first opportunity that together with what we can get here will probably answer until the end of the war, supposing that to be as near at hand as I think it is. We hear every day of course read cases under the system of impressment. Robberies and thefts have become so common that they have almost ceased to excite surprise. We heard a day or two ago that Mr. Bingham had kept an impressing officer off by getting his gun and declaring solemnly he would shoot him if he attempted to break open his home. They had before taken all he had to spare. He has always been very kind and liberal to the poor and has done all he could to sustain the government by vesting his money in its stock &c.
I fear none of our rule as confederate or Hate are equal to the occasion. I place more reliance in the wisdom and calm judgement of Gov. Graham than in any other person, but unfortunately he is not now in a position to do much. May God help us. We are helpless without. Best love to Patty and the children. You may tell your uncle Richard that your mother has just returned from a trip to your grandmother & found her still improving. This entry was posted in Southern Historical Collection and tagged Battle Family Papers, Chapel Hill (NC), Kemp Battle, William Horn Battle. Bookmark the permalink.